I've been somewhat 'putting up' with Github always asking for my username and password when I clone a repository. I want to bypass this step because it is an annoyance within my workflow. I tried setting up an SSH key (which I successfully did) using this guide. https://help.github.com/articles/generating-ssh-keys and I was successful. My problem is that I am still asked for my github password and passphrase when cloning a repository (using SSH). My understanding was that after I set up this SSH key, I would no longer have to do that. I am a little unsure what to ask, so I will just state my goal. I want to be able to clone repositories without having to put in my Github information all the time. What am I missing with my SSH key? 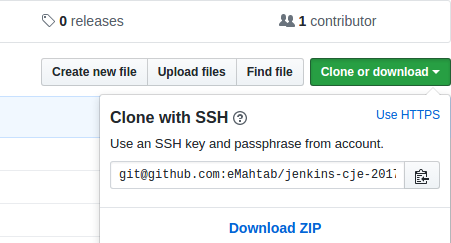 If anyone can provide some guidance or resources I would appreciate it, because I've always felt a little lost when it came to SSH authentication in GitHub. Hi MYNAME! You've successfully authenticated, but GitHub does not provide shell access. When I input my password, should that fail first? Then, when I enter my passphrase, it passes. If you work with HTTPs urls, it'll always ask for your username / password. If you're correctly using SSH when cloning / setting remotes. Then make sure you have a ssh-agent to remember your password. That way, you'll only enter your passphrase once by terminal session. If it is still too annoying, then simply set a ssh-key without passphrase. There may be times in which you don't want the passphrase stored in the keychain, but don't want to have to enter the passphrase over and over again. This will ask you for the passphrase, enter it and it will not ask again until you restart. Once again, this will ask you for the passphrase, enter it and this time it will never ask again for this identity. You will then be prompted for your password, which will be stored in your keychain. I tried all the answers here and none of these answers worked! My password would not persist between sessions/restarts of my Mac. Note: change the path to where your id_rsa key is located. And now my password is remembered between restarts of my Mac! You'll be prompted for current pass phrase enter it. It will never ask you to enter the password again. It'll ask for passphrase in the second command, and that's it. Note: You will have to do this again after every restart. This Answer worked for me in Ubuntu. To check if remote's URL is ssh or https, use git remote -v.
For Mac OSX Sierra, I found that the fixes suggested in the github issue for Open Radar fixed my problem. Seems like Sierra changed the default behavior (I started having this problem after upgrading). You can add as many IdentityFile entries as you need, but this is the default setup. This is the "trending" answer on the openradar link above, ATM, as well. I already had set a passphrase but for some reason it wouldn't recognize it anymore. So I just added the identity file to my keychain again using ssh-add -K and it stopped asking for my password. Problem seems to be because you're cloning from HTTPS and not SSH. I tried all the other solutions here but was still experiencing problems. This did it for me. Find out if you have it installed. If it's not installed, you'll be prompted to download it as part of Xcode Command Line Tools. The next time you clone an HTTPS url, you'll be prompted for the username/password, and to grant access to the OSX keychain. After you do this the first time, it should be saved in your keychain and you won't have to type it in again. I'd like to add an answer for those who may still need to enter the password because they have set IdentitiesOnly as yes. This may cause by multiple keys and the identity file, being keys for git or server. I found it didn't work. I can just log in by entering ssh 12gpu. Then you can add multiple ssh keys using your favorite names, and you only need to add the settings like the above four lines to the config file. Host is the name you'd like to enter when you connect to the server later; the HostName is the server's ip or domain like github.com; User is the user name you log in the server like the user name or git for github or gitlab; and the IdentityFile is the file where you store the key you have generated. $ ssh-keygen -t rsa -b 4096 -C "your comments"
You can see which version of ssh-add you have by running which ssh-add. Use ssh remote url provided by Github not https. Not the answer you're looking for? Browse other questions tagged git github ssh ssh-keys or ask your own question. How do I avoid the specification of the username and password at every git push?